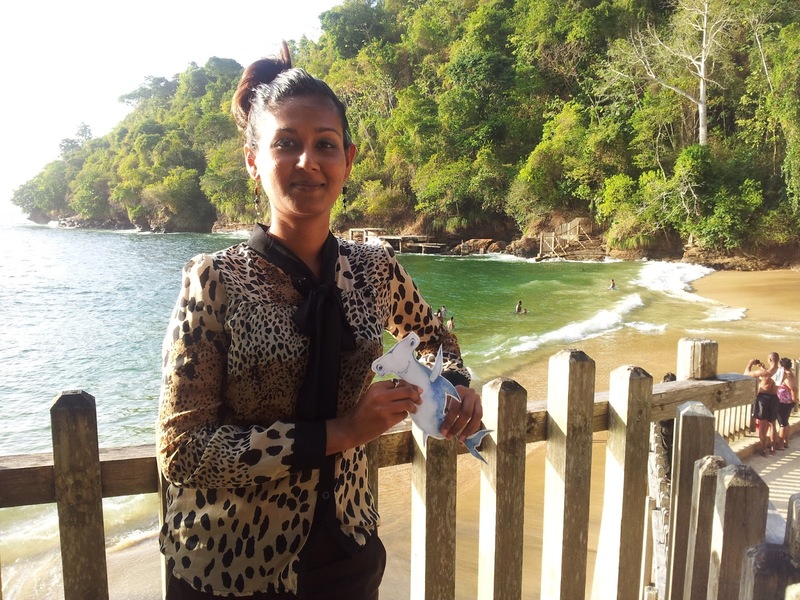 Shark Stanley reached the shores of Trinidad and Tobago today, marking the 120th country of our campaign. Although our petition is printed, this photo will be plugged in to show the global diversity of our support. We are still looking for photos from these countries, so if you live there, or know someone who lives there, please help us find more supporters. Lebanon just became the 178th country to join the Convention on the International Trade in Endangered Species of Wild Fauna and Flora. This makes me think of two things. First of all, Shark Stanley has already been to Lebanon and I'm looking forward to sharing these photos with their representatives. And second, all the organizations working at CITES this year will have to update their materials to reflect the new total number of member countries. "Sharks are in many ways a symbol of the ocean. Exceptionally mysterious, powerful, unknown, frightening and of course beautiful. They run through the human psyche and run through our lives." On February 15th, the Shark Stanley team from the Yale School of Forestry and Environmental studies held an interdisciplinary symposium on shark and marine conservation. This is the first of eight SharkTalks from the event. "Photography: The Language of Conservation" features David Doubilet, one of the world's most celebrated underwater photographers. Since his first assignment in 1971 Doubilet has become one the most published photographers in the history of the National Geographic Magazine. Doubilet has spent five decades descending beneath the surface in the far corners of the world from interior Africa, equatorial coral reefs, and rich temperate seas to beneath the polar ice. He believes photography is a language that creates a visual voice for the oceans and connects us to the beauty and silent devastation happening within the invisible world below. Doubilet serves as contributing editor for several publications and is an author of twelve titles, including the award-wining Water Light Time, and his photographic awards include numerous Picture of the Year, BBC Wildlife, Communication Arts and World Press awards. 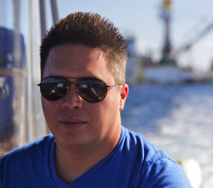 The Pew Charitable Trusts shark policy expert Angelo O'Connor Villagomez was interviewed by Shark Attack Survivors for Shark Conservation's Scott Curatolo-Wagemann in a series of podcasts streaming this week on Sharkbait's Chumline. The first three are posted, with additional podcasts to follow on Thursday and Friday. The podcasts are also available for free on iTunes. Community Centred Conservation just published this amazing video of Shark Stanley and Manta Reina and the outreach they are doing in communities. Thank you! Shark Stanley is on top of the world, not just because he's traveled to 118 countries (thank you, Mauritania! ), but because Laura Rice took him to Uhuru Peak on Mount Kilimanjaro in Tanzania. Amazing! Next stop: Bangkok, Thailand. Aaron, the man pictured in the photo, brought along something else besides Shark Stanley. Right after this photo was taken he got down on one knee and popped the big question. And Laura said yes! Shawn Heinrichs with Manta Reina. Visit www.mantarayofhope.com for more info. As the finale to the Manta Ray of Hope Campaign leading up to the CITES meeting in early March (a joint project by WildAid, Shark Savers and Manta Trust), we completed a very special Manta Ray project in February 2013 in Kona Hawaii, creating a film that truly captures the beauty and intimacy of an encounter with Manta Rays! Below is the first time release of our musical film, Mantas Last Dance! 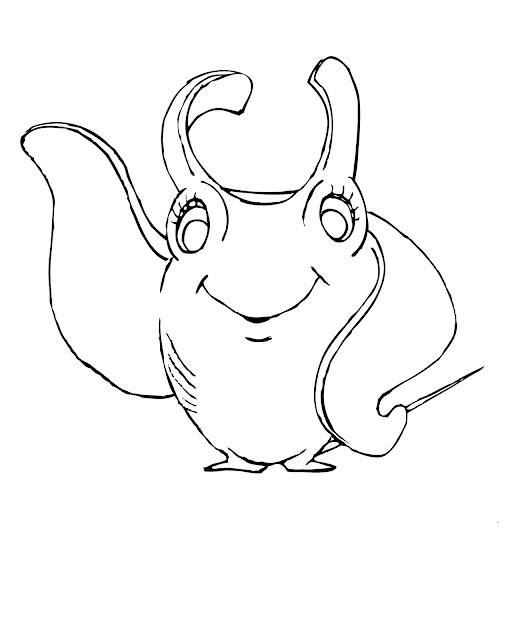 You can show your support for listing manta rays on CITES Appendix II by taking your photos with Manta Reina and uploading them to social network websites Facebook, Twitter, and Instagram. 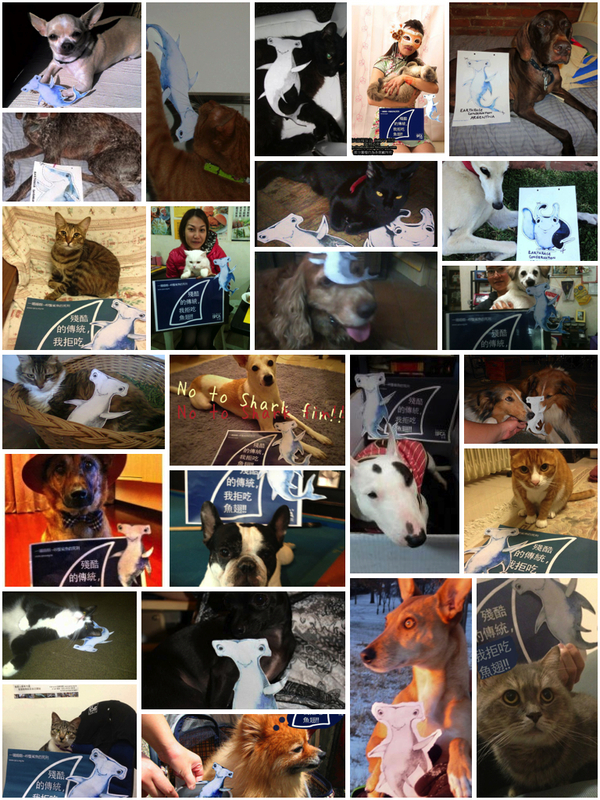 We also encourage you to send your photos to your government representatives voting at CITES. Coming to a theater near you. The last two scenes are shot on Saipan with Kathy Pagapular Ruszala's sixth grade class from San Vicente Elementary School. Looking forward to seeing this movie. Efforts to conserve sharks have spread rapidly across the Pacific in the past few years. Palau declared full protections for sharks in 2009, and Tokelau, the Marshall Islands, French Polynesia, and the Cook Islands have established shark sanctuaries since then. Every U.S. state and territory in the tropical Pacific also has taken steps to limit trade in shark fins from their shores. As these protections have come into force, The Pew Charitable Trusts has worked with government and nonprofit organization partners to implement the new laws. Last year, Pew sponsored a marine enforcement training in the Marshall Islands and a shark-fin identification training with fisheries officers in Fiji. We also worked with the Palauan government and the Micronesian Shark Foundation to enforce shark protections in the Southwest Islands of Palau, resulting in the apprehension of two illegal fishing vessels. 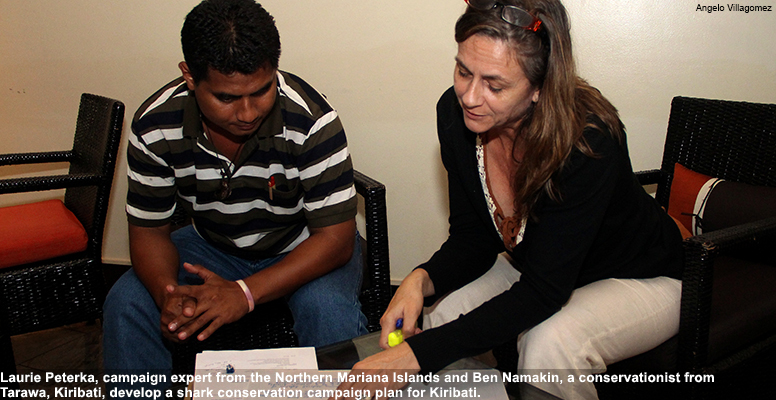 In addition, we are working with countries interested in implementing new shark conservation measures. Although countries in the Pacific have distinct histories, languages, and cultures, they are similar in many ways. Conservationists working in one jurisdiction often deal with similar issues as those living in another. They can learn from one another, but distance and communication limitations can make connecting difficult, even in the digital age. This was the inspiration behind the Pacific Shark School, a three-day workshop that took place at the end of January in Suva, Fiji. Policy and shark conservation experts from Saipan, the Federated States of Micronesia, Fiji, and the United States met to share experiences from protection efforts in their islands. The workshop was also an opportunity to teach nonprofit organization leaders how to advocate for stronger shark management and conservation measures and how to accomplish policy changes at home. 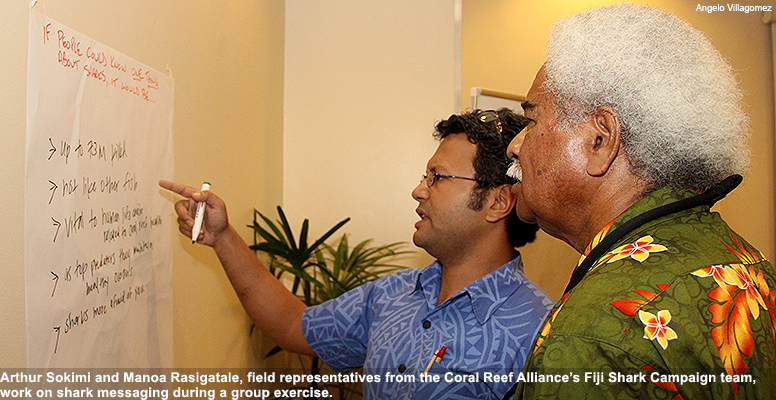 Senior staff of the San Francisco-based Coral Reef Alliance, our partner in Fiji, joined Pew shark conservation experts Angelo Villagomez and Jen Sawada in organizing the workshop. Topics included shark ecology and ecotourism economy, regional and international shark management efforts, and campaign strategy. Although participants agreed that more action is needed at the regional level, little has been done to date by the Western and Central Pacific Fisheries Commission, which was established to prevent overfishing and protect fish stocks and habitat. At its last meeting, a proposal to reduce shark bycatch was defeated, and the commission could be years away from comprehensive shark management. Until scientific catch limits in this region are set that take into consideration sharks’ unique biology, it will be up to individual countries–and the people who attended Pacific Shark School–to help implement measures protecting sharks within their jurisdictions. 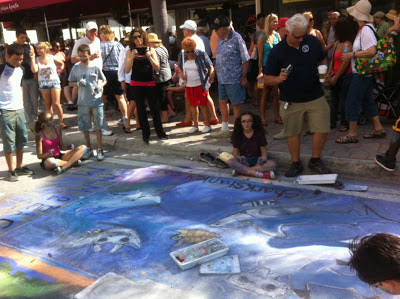 At 9 AM on Saturday morning, it looked like the Lake Worth Street Painting Festival was in for a bright, beautiful sunny weekend. Things were a little blustery, but the breeze was nice to keep us from getting too hot in the south Florida sun. Palm Beach Maritime Academy had four spots at this year's festival, and we decided we'd dedicate one of them to Shark Stanley, the paper shark criss-crossing the globe to find support for protecting sharks and manta rays at the upcoming Convention on the International Trade in Endangered Species of Wild Fauna and Flora. We started the morning by cutting out the outlines that we had traced from projecting the cover of The Adventures of Shark Stanely and Friends. Then we placed them on our assigned spot, traced them out and then began the all day task of coloring them in and bringing them to life! And then spent hours coloring everything in. After careful consideration, and reading paragraphs from students about what they could offer, we assigned a student ambassador for Shark Stanley to talk to the crowd, inform, educate, answer questions, and take pictures of people holding Stanley. Justin Vicari did a wonderful job explaining the purpose of the book and why we were making such a big deal about it on the streets of Lake Worth. He showed some bystanders a copy of the book and told them where to find it and all seemed eager to learn more. The kids were the most intrigued, wanting to know the names of all the characters and what they were like. Let's not forget Myrtle the Turtle and Pipa the Pilotfish! 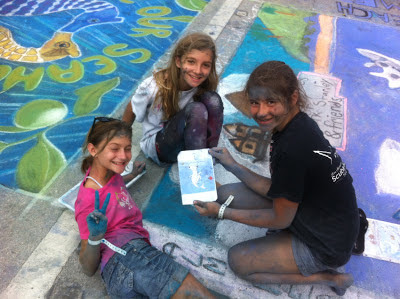 It was such an inspiring experience.The street painting festival has always been described as performance art, but this year we really felt it. We were sharing so much information with this one work of art and making a difference by sharing with hundreds of people at a time. People were so captivated by the story behind our artwork and took many pictures while asking questions. The 6th and 7th grade were the main contributors this year, which is pretty young for such a huge festival like this where established artists from all over come to display their talents. These students held there own among them and people could really feel the heart going into this particular piece. About 5 PM, we had just about finished and were planning to add the finishing touches and take the final pictures on Sunday. We looked lovingly at our friends and thought fondly of our adventures with them and said good night. About 2 hours later the rain came. Our work is no longer visible on the street but it is not gone. It will live on in the memories of so many. You can view all of our photos on Shark Defenders Facebook Page. It’s big business, a big vote, and a big moment for sharks. The Pew Charitable Trusts has developed a series of podcasts that are being released serially during the upcoming Conference of the Parties to the Convention on International Trade in Endangered Species of Wild Fauna and Flora (CITES). In the first installment, Sue Lieberman of the Pew Charitable Trusts explains which of the seven species advocates are seeking to protect at this year's conference and how the CITES treaty works to protect more than 30,000 endangered species. The Conference of the Parties to the Convention on International Trade in Endangered Species of Wild Fauna and Flora, or CITES, takes place in Bangkok, Thailand - March 3 to 14. At this critical meeting, governments will debate adding five species of sharks and two species of manta rays to the treaty. A positive result will limit international trade of shark fin and meat and manta gill rakers and help reduce the threat of over fishing facing these species. For nearly 40 years, CITES has shielded thousands of plants and animals from overexploitation through international trade. This treaty is considered one of the best-enforced international conservation agreements. In July 2011, The Bahamas declared a shark sanctuary in its Exclusive Economic Zone. Two months earlier, scientists had tagged 12 oceanic whiteips around The Bahamas and created an animation that tracked the movement of three of those sharks. The scientists found that although they are highly migratory, oceanic whitetips spent most of their time within the sanctuary. Sanctuaries are an important refuge for sharks. Learn more: http://www.pewenvironment.org/sharks. The Oceanic Whitetip Shark (Carcharhinus Longimanus) is one of the species of shark proposed for listing on Appendix II of the Convention on the International Trade in Endangered Species of Wild Fauna and Flora which takes place in Bangkok, Thailand on March 3, 2013. 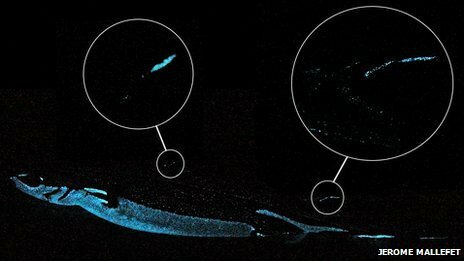 A glow-in-the-dark shark scares off predators with "lightsaber-like" spines on its back, a study suggests. The research was carried out on the velvet belly lanternshark, a small species found in the deep waters of the Atlantic Ocean and Mediterranean Sea. The scientists believe that while the light-up spines can be seen by larger, potentially dangerous fish, they are harder for the shark's prey to spot. The study is published in the Nature journal Scientific Reports. Thank you to everyone who sent in photos of their pets with Shark Stanley. It is important that shark loving pets have a voice at the upcoming Convention on the International Trade in Endangered Species of Wild Fauna and Flora. 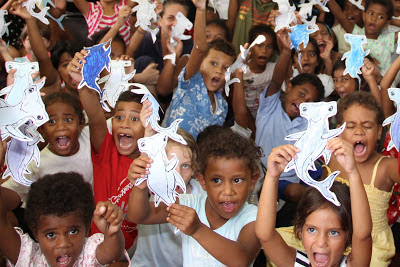 These students at Pacific Harbour Multi Cultural School did an incredible job coloring their own Shark Stanleys. When we saw them, we realized that we hadn't yet posted our "Color-me" Waqi, Pierre, and Reina. A million apologies! Here they are posted below. What are you waiting for? Get to coloring (especially if you live in these countries). 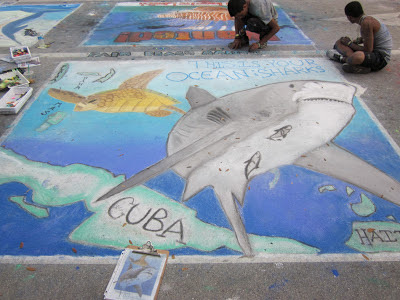 Palm Beach Maritime Academy has participated in the Lake Worth Street Painting Festival for 8 years with the intention of providing our students with a creative outlet, and spreading the word about ocean life and issues. Our school's over-arching theme is marine conservation and awareness. Many of our students and staff are ocean enthusiasts and conservation advocates. For example, Steve Allen was a NOAA Teacher at Sea two years ago and as a science teacher, has brought so much knowledge and awareness to our team. Mr. Allen and a former art teacher, Yvette Pearson, (who is now our ESE coordinator) lead our school's involvement at the festival. Last year we made a statement about lionfish in South Florida. Our reefs have become overcrowded with the invasive species, voracious predators which consume other fish not adapted to deal with them. This invasion is creating long lasting ecological consequences. Divers have even begun hosting fishing tournaments to help bring down the population and initially the artwork brought about a lot of confusion with tourists and even some locals. They wondered why we advocated for killing these beautiful fish. It was a great chance to educate the public! We also did a shark scene and titled it after Jim Abernathy, Wyland, and Guy Harvey's movie, "This is Your Ocean: Sharks." Some of us were able to see the movie at his special viewing in West Palm Beach last year and it was an amazing inspiration and testimony of life with sharks and what could happen without them. 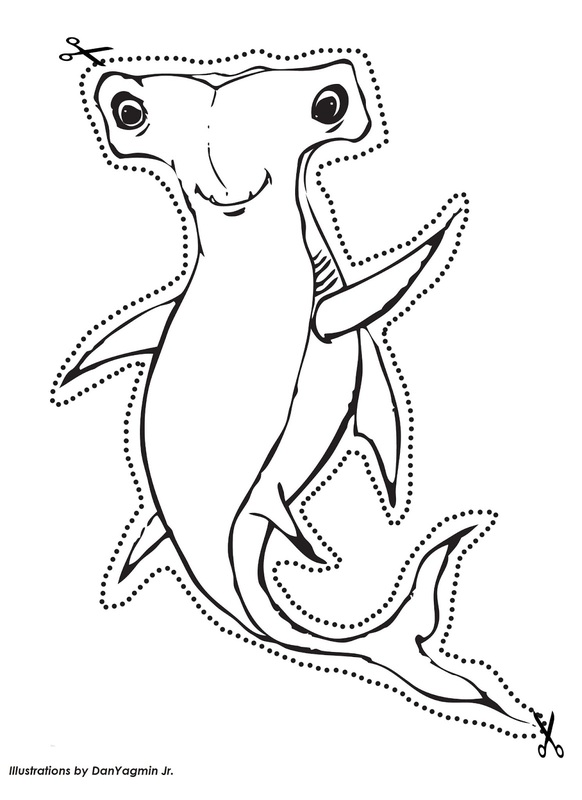 This year we have four sections on the street and one will be of the cover of the Shark Defenders new book, "The Adventures of Shark Stanley and Friends." We are so excited to be a part of the Shark Stanley movement and will be guest posting a short blog series about our own adventures with Stanley, Waqi, Reina and Pierre, as we bring them to life on the streets of downtown Lake Worth, Florida. Stay tuned for more pictures and information and if you live in the area, please come visit us Feb. 23rd and 24th. The Convention on the International Trade in Endangered Species of Wild Fauna and Flora (CITES), a treaty somewhat like the international endangered species list, begins next Sunday on March 3, 2013. We have collected Shark Stanley photos from 113 countries (thank you, Pakistan!) to date and have already started creating our photo petition. If you do not see your country's flag on one of these pages, we have not received enough photos from your country to make one. We require a minimum of 10 photos, but prefer 20, to make a collage. If you have already sent us your photo, you can help us represent your country by taking at least 9 more Shark Stanley photos of your friends and family and mailing them to us at info@sharkdefenders.com. Still want to do more to help? We need citizens to contact their CITES authorities in every country (and especially South Africa, Argentina, and Chile). Here are the five best ways to contact them. You can start by looking up your country's CITES authorities on the CITES website. 1) Contact your CITES authority in person. They likely won't leave for Bangkok until next week. You can make an appointment to visit their office, show them photos of your friends, family, and fellow citizens with Shark Stanley, and ask them to support shark protections. Person to person contact is the most effective means of advocating for shark protections. 2) Contact your CITES authority over the phone. If you do not live in the same city as the people who will represent you at CITES, you can still call their office and ask to speak with them. 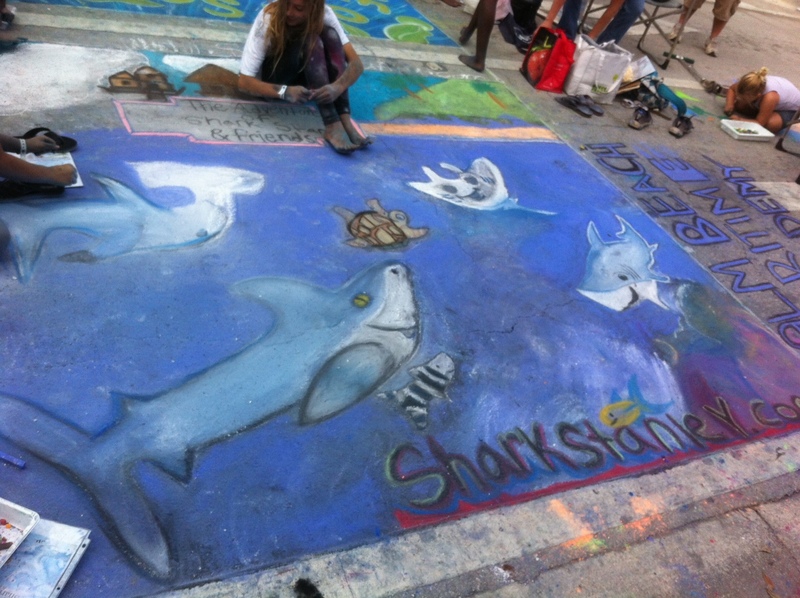 Tell them that you support shark conservation and that you went them to vote yes on the shark and manta ray proposals. This is a highly effective means of advocating for shark protections. 3) Contact your CITES authority using email. This is not the most effective means of reaching your representatives, but photos from you will carry more weight than photos emailed from us. 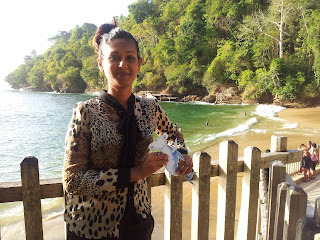 We've posted an email example from our supporter Shima Abdullah. She sent the email to her representatives in Singapore last week. 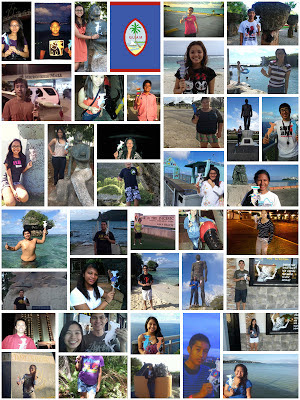 4) Take your photo with Shark Stanley and email it to info@sharkdefenders.com. When you are done, take photos of 10 of your closest friends and family and mail those to us, too. We will hand deliver your photos to your representatives at the CITES meeting in Bangkok next week (and we'll post photos to prove it!). 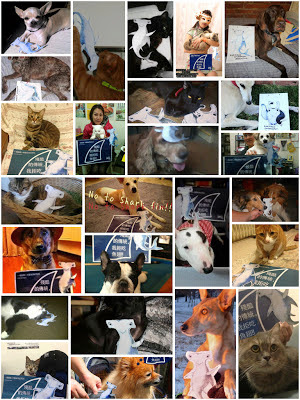 5) Sign the many online CITES petitions from other organizations. We expect to have some last minute scrambling right up to the end of the meeting on March 14, but can only guarantee that we will turn over your photos if you get them to us by Monday, February 25. I would like to wish you and the Singapore representatives a safe trip and a fruitful and success Conference this March. Singapore is one of the largest consumers of shark fin soup and the second largest trading center for shark fins. We have the clout to reverse this consumption trend, not just in Singapore but other Asian cities. We are a jet-set, trendsetting, cosmopolitan Asian Tiger and we have a lot of influence when it comes to political discourse, social rituals and even CUISINES in the region. We can do the right thing and help protect more shark species – it has been scientifically proven that a lot more species are threatened and endangered. We need to set a good example in the Asia Pacific region. There are many friends, family members and even strangers who I had a splendid opportunity to discuss about the shark fin soup controversy. I am delighted to know so many like-minded people who are also against eating shark fin soup and protecting the sharks! I would like to share some photos that my friend and I took (please see attached). I hope you will consider my email and look forward to hear good news from you. Enjoy yourself in Bangkok and good luck! William Kostka was born and raised on the island of Pohnpei, in the Federated States of Micronesia. 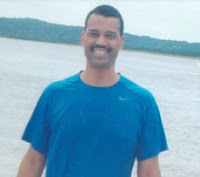 In 1998, he helped found, and became the first board chairman and executive director of, the Conservation Society of Pohnpei, the leading local conservation NGO in the nation. 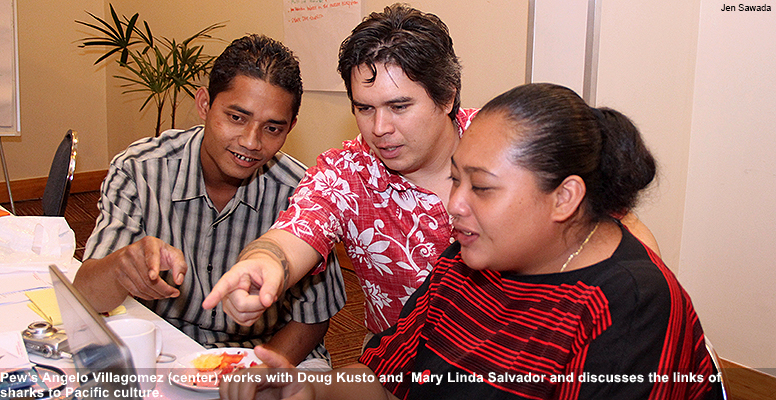 In 2002, Kostka also co-founded and currently serves as executive director of the Micronesia Conservation Trust, a charitable and irrevocable corporation organized to support biodiversity conservation and related sustainable development for the people of Micronesia by providing long-term sustained funding and capacity building support. He serves as coordinator of the World Conservation Union- World Commission on Protected Areas Micronesia Program and also sits on the Pacific Advisory Panel of the Global Green-grants Fund. 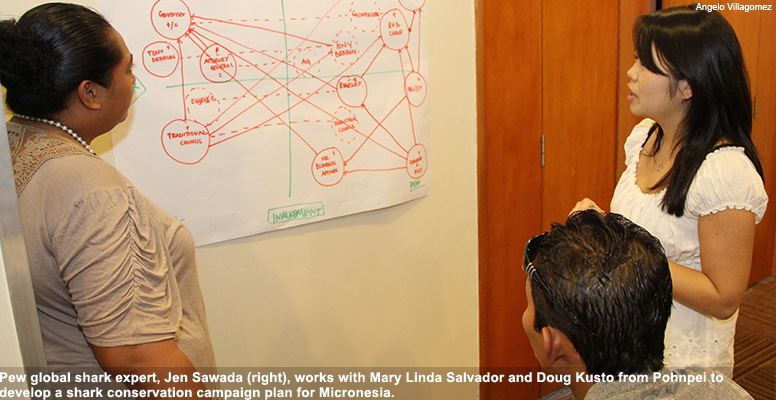 In 2006, Kostka became a Pew Marine Fellow and used his fellowship grant to help launch and further the implementation of the Micronesia Challenge Initiative, a common commitment by the countries and territories of Micronesia to a comprehensive system of resilient protected-area networks. This commitment will see at least 30 percent of the nearshore marine and 20 percent of the forest resources across Micronesia under effective conservation by 2020. Please visit www.ourmicronesia.org for more information on the Micronesia Conservation Trust. 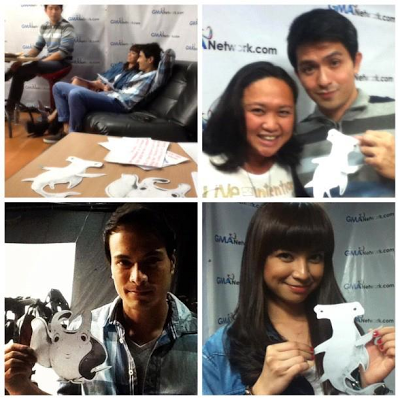 Celebrities Dennis Trillo, Rafael Rosell, and Glaiza de Castro star in the drama series Temptation of Wife on GMA Network, the channel watched by millions of Filipinos across the world. When Eden saw these photos she reacted like an American teenager at a Justin Bieber concert. Come on Ian Somerhalder! You like sharks don't you? Where are the Shark Stanley photos with the cast of Vampire Diaries? We've started putting together the collages from the thousands of photos you have been sending. Each collage will be made into a page in our photo petition. 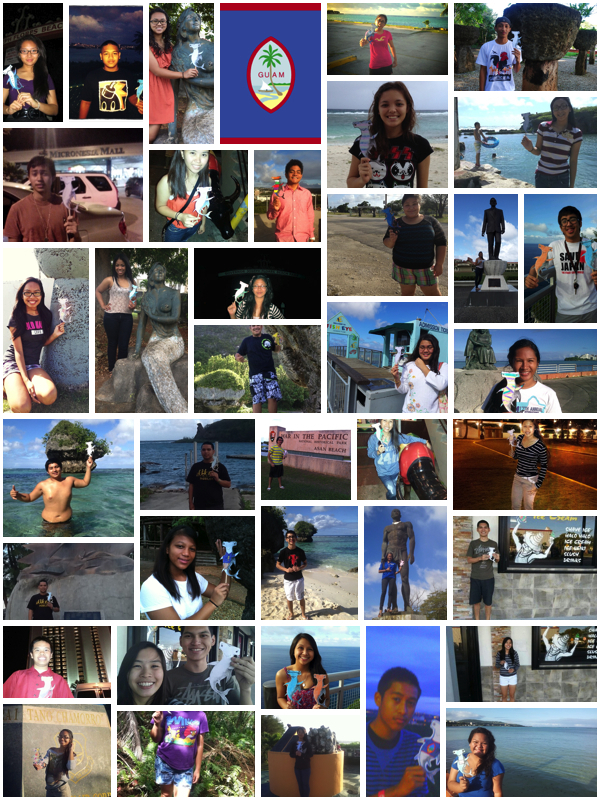 It takes a minimum of 10-20 photos to make one of these collages, so while Shark Stanley has visited 104 countries since we launched our campaign, we do not have enough photos from every country to make a page to represent everyone. We will use all of the photos we receive in our petition, of cousre, but if you want your country to have a full page, you have only until Monday, February 25 to help us get the minimum number of photos. 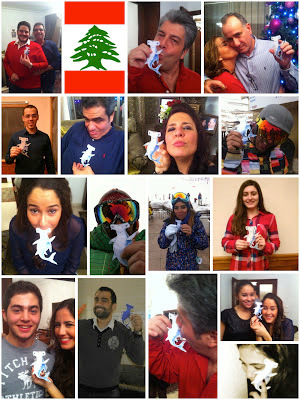 If you do not see your country's flag in our Facebook album of Shark Stanley collages, what are you waiting for? Get your cutout of Shark Stanley and start snapping photos with your friends and family! 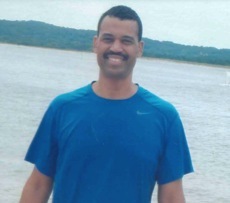 Angelo Villagomez has worked with the Pew Charitable Trusts since March 2011 and has helped develop shark conservation policies in The Bahamas, Northern Mariana Islands, Guam, Marshall Islands, Kosrae, Cook Islands, and Western Central Pacific Fisheries Commission. Villagomez is founder and senior editor of Shark Defenders and godfather of the Mariana Trench Marine National Monument. 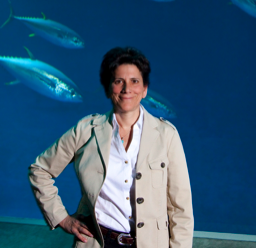 Dr. Barbara A. Block’s research is focused on how large pelagic fishes utilize the open ocean environment. Her investigations center upon the evolution of endothermic strategies in tunas, billfishes, and sharks, and she combines physiology, ecology, and genetics with oceanography and engineering. Dr. Block and her colleagues at the Monterey Bay Aquarium have also established the Tuna Research and Conservation Center, a unique facility that permits physiological research on tunas. Dr. Block is a recipient of the Presidential Young Investigator Award from the National Science Foundation and the MacArthur Foundation Fellowship. She has a PhD from Duke University. Dr. Paul Anderson is Research Scientist and Leiden Conservation Foundation Fellow at the Mystic Aquarium, where he rounds out the expertise of the Research and Veterinary Services Department with his insights into fish and elasmobranch behavior, physiology, and sensory biology. He is especially interested in how humans can leverage those insights to improve aquarium husbandry and exhibitry, and empower informed management of wild populations. Dr. Anderson has served as an Aquarist and Mobile Exhibit Coordinator for Mote Marine Aquarium in Sarasota, FL; Senior Aquarist and Education Coordinator for the Pier Aquarium in St. Petersburg; and Conservation and Research Coordinator at the Florida Aquarium in Tampa, FL. He has a PhD in Fisheries and Aquatic Sciences from the University of Florida. 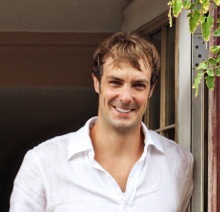 Dr. Demian Chapman is an internationally recognized shark expert with almost a decade of experience. 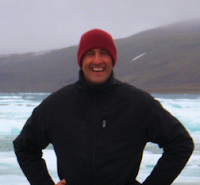 He serves as Assistant Director of the Institute for Ocean Conservation Science and is a Blue Ocean Fellow. Dr. Chapman’s research focuses on the molecular ecology of large marine vertebrates, including the development of wildlife forensics applications. Dr. Chapman currently manages field research projects on sharks and the Shark Trade in Belize, The Bahamas, Panama, Fiji, the U.S., and Hong Kong. 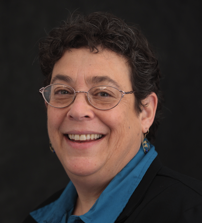 Dr. Susan Lieberman is Director of International Policy at the Pew Charitable Trusts, and has worked in international biodiversity conservation for more than 25 years. She currently leads an integrated program across treaties, regional fisheries management organizations and other intergovernmental organizations, including the United Nations, to provide science-based research, policy analysis and expertise to ensure the sustainability of marine species and ecosystems. 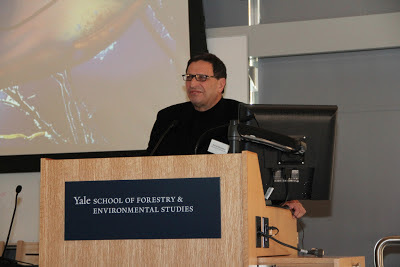 Dr. Lieberman served as the Director of the Global Species Programme of WWF-International and worked at the U.S. Fish and Wildlife Service for 11 years. Her Ph.D. research at the University of Southern California focused on tropical ecology and amphibians and reptiles in Costa Rica. David Doubilet is one of the world’s most celebrated underwater photographers. Since his first assignment in 1971 Doubilet has become one the most published photographers in the history of the National Geographic Magazine. Doubilet has spent five decades descending beneath the surface in the far corners of the world from interior Africa, equatorial coral reefs, and rich temperate seas to beneath the polar ice. He believes photography is a language that creates a visual voice for the oceans and connects us to the beauty and silent devastation happening within the invisible world below. Doubilet serves as contributing editor for several publications and is an author of twelve titles, including the award-wining Water Light Time, and his photographic awards include numerous Picture of the Year, BBC Wildlife, Communication Arts and World Press awards. Artist, writer, naturalist, and Yale graduate James Prosek made his authorial debut at nineteen years of age with Trout: an Illustrated History (Alfred A. Knopf, 1996), which featured seventy of his watercolor paintings of the trout of North America. Prosek has written for The New York Times and National Geographic Magazine. In 2004, he co-founded a conservation initiative called World Trout with Yvon Chouinard, owner of the Patagonia clothing company. His book Eels: An Exploration, from New Zealand to the Sargasso, of the World's Most Amazing and Mysterious Fish (2010), is the subject of a documentary for PBS series "Nature," which will air in the spring of 2013. His latest book, Ocean Fishes (Rizzoli, 2012), is a collection of paintings of 35 Atlantic fishes. 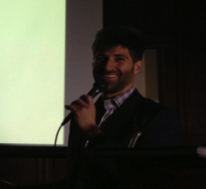 Prosek is a curatorial affiliate of the Peabody Museum of Natural History at Yale and a member of the board of the Yale Institute for Biospheric Studies. Currently, he is working on a book about how we name and order the natural world. Krishna Thompson is a shark attack survivor who has become a motivational speaker and advocate of shark conservation, sharing his experience with audiences and other amputees as a testimony to the strength of the human spirit and the sheer will to survive. 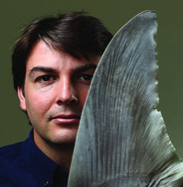 Thompson has worked on shark issues with the Pew Environment Group, members of congress and UN delegates, and he is the star of “Shark Fight” on Discovery. Thompson is a counselor to other amputees and helps to promote work for a prosthetics company and boost the importance of blood donations. Barton Seaver –Director, Healthy and Sustainable Food Program at the Center for Health and the Global Environment, Harvard School of Public Health. National Geographic Fellow and Washington, D.C. chef Barton Seaver has dedicated his career to restoring the relationship we have with our ocean. It is his belief that the choices we are making for food are directly impacting the ocean and its fragile ecosystems. His work with the Healthy and Sustainable Food Program aims to highlight the important connection between environmental resiliency and human health while ensuring the profitability of local food products. This week the Pew Charitable Trusts released a new video on efforts in Palau, Honduras, and the Marshall Islands to patrol and enforce their huge shark sanctuaries. The Pew Charitable Trusts has worked with eight countries and territories around the world in recent years to establish shark sanctuaries, implementing policies that ban commercial fishing of sharks and possession of fishing gear used to target them. Enforcing laws in these sanctuaries, which can span millions of square kilometers, may seem like a daunting task. Yet officials in such places as the Marshall Islands, Honduras, and Palau have proved that they do enforce sanctuary laws and that their countries can benefit from strong shark protections. As if to hammer home the point that shark sanctuaries are working, La Tribuna reports today that 32 shark poachers have been detained in Honduras. Authorities confiscated 11,000 pounds of shark steaks from the fishermen, which authorities estimate represents about 1,200 to 1,500 dead sharks. While it is disappointing that this many sharks were killed, it is encouraging that enforcement is taking place and will hopefully serve as a deterrence to future poaching. 1) Visit SharkStanley.com, download your favorite character, cut him or her out, and take your photo in front of an iconic location near where you live. But why stop there? 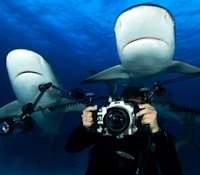 Go take photos with 20 of your closest friends and email them to us at info@sharkdefenders.com. We are still accepting photos from every single country. 2) But....Shark Stanley still hasn't been to every member country of the Convention on the International Trade in Endangered Species. You can help him get there by looking at the list of countries below. If you have a friend, family member, colleague, pen pal, or contact with someone living in any of these countries, please email them about Shark Stanley and ask them to send in their own photos. Shark Stanley has been to 96 countries so far and with your help we are well on our way to reaching all 177 CITES member countries in time for the start of the next meeting on March 3, 2013. Benin, Botswana, Burkina Faso, Burundi, Cameroon, Central African Republic, Chad, Comoros, Congo, Cote d’Ivoire, Djibouti, Equatorial Guinea, Eritrea, Ethiopia, Gabon, Gambia, Guinea, Guinea-Bissau, Lesotho, Liberia, Libya, Madagascar, Malawi, Mali, Mozambique, Namibia, Niger, Rwanda, Sao Tome and Principe, Seychelles, Sierra Leone, Somalia, Swaziland, Togo, and Zambia. Albania, Armenia, Belarus, Bosnia and Herzegovina, Bulgaria, Cyprus, Greece, Liechtenstein, Lithuania, Luxembourg, Malta, Montenegro, Norway, Moldova, San Marino, Slovakia, Slovenia, Macedonia, and Ukraine. Barbados, Bolivia, Cuba, Dominican Republic, Grenada, Guyana, Jamaica, Nicaragua, Panama, Paraguay, Saint Kitts and Nevis, Saint Lucia, Saint Vincent and the Grenadines, Suriname, and Trinidad and Tobago. Azerbaijan, Brunei Darussalam, Kuwait, Kyrgyzstan, Laos, Saudi Arabia, Syrian Arab Republic, and Yemen. Papua New Guinea, Samoa, Solomon Islands, and Vanuatu. My fellow kababayans who want to see sharks protected at CITES should contact Director Perez and ask him to support the proposals to list oceanic whitetip, hammerhead, porbeagle, and manta ray on Appendix II, and to make that support public ahead of the meeting. All four species are already protected by domestic law and it is hard to imagine that we would vote against protecting these species at an international level when they are also protected domestically. Manta rays are protected by domestic law in the Philippines because of their importance to our economy. There are several places around the country where they can be found, and in each location they create local jobs. Tourists spend money at local dive shops, restaurants, and hotels. The hammerhead shark is a de facto protected species in the Philippines. When Costa Rica added the species to CITES Appendix III last year, the species simultaneously became protected in our waters. Under the laws of our government, any species that is listed by CITES automatically becomes protected in our country and in our national waters. 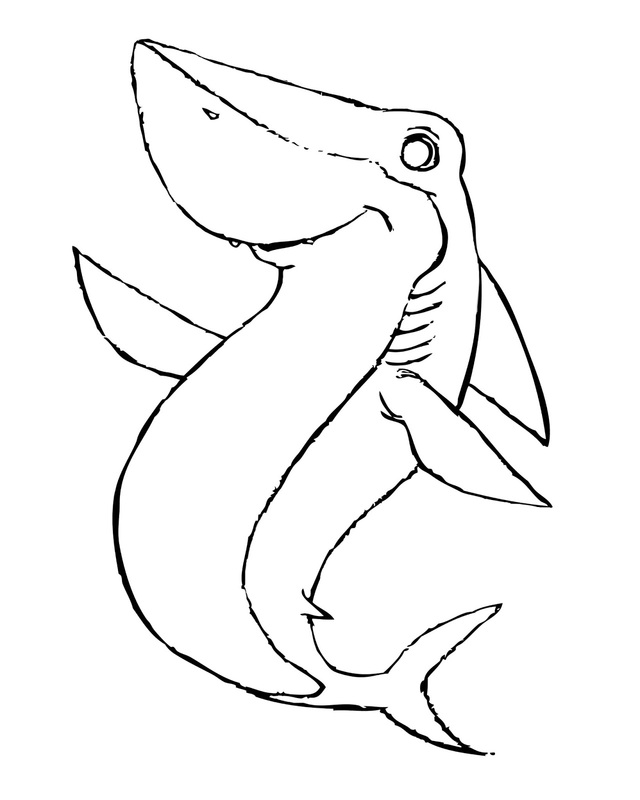 The porbeagle shark, although it does not occur in our waters, is also protected in our country for the same reason. The European Union listed the species on CITES Appendix III last year. 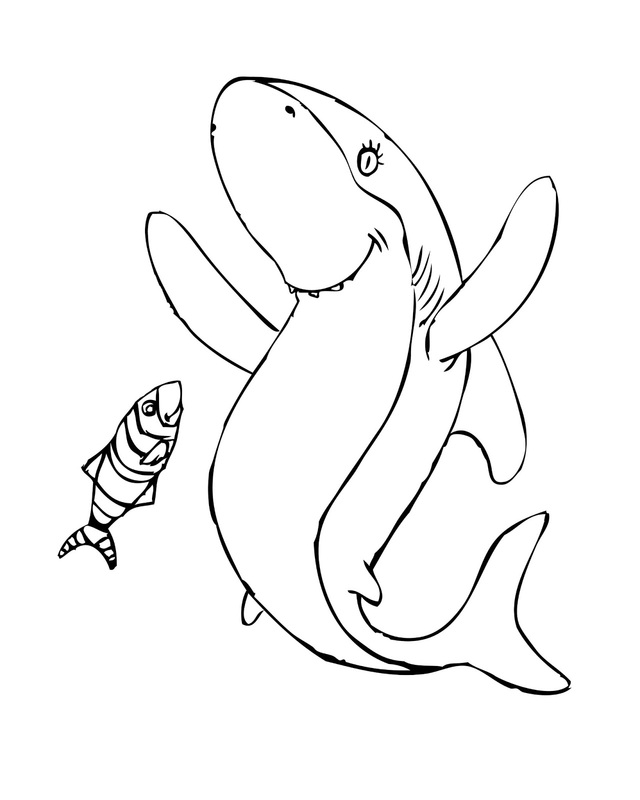 The oceanic whitetip shark, while not yet listed on CITES, is a protected species at the Western Central Pacific Regional Fisheries Management Commission, of which we are a member. At their meeting in Guam last year, all of the countries and territories fishing in the Western Central Pacific Ocean agreed that this species met the scientific criteria for protections and banned all fishing. I encourage you to contact Director Perez and ask him to support the four proposals to protect sharks and manta rays at CITES, and to make his support public ahead of the CITES meeting which starts on March 3. American President Barack Obama recently announced his country’s support for all four proposals and the Philippines should do the same. Pete Bethune, New Zealand conservationist and world record holding speedster boat captain (and former Sea Shepherd member), gives his endorsement for Shark Stanley! Thanks, Pete! 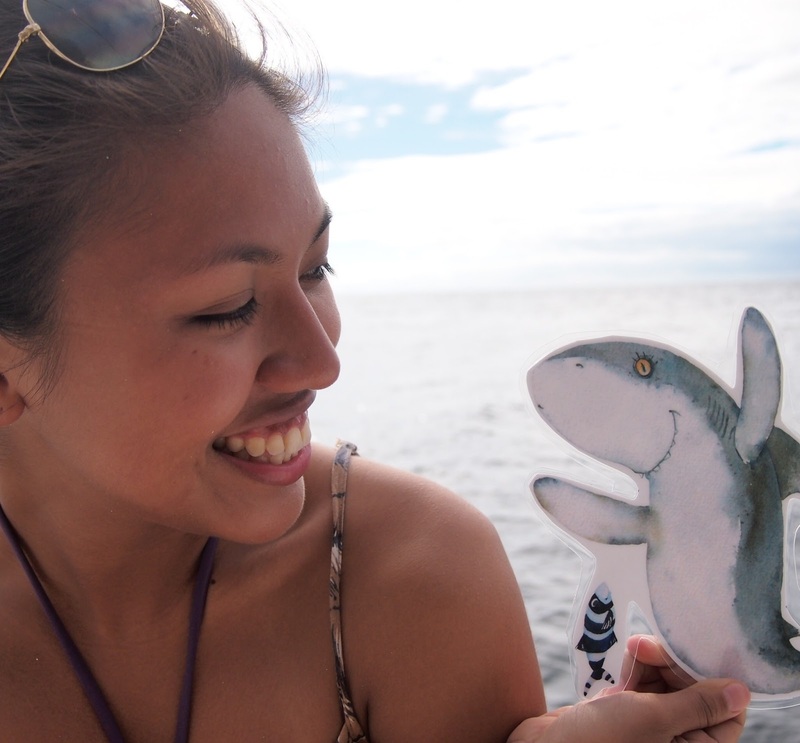 Shark Stanley has now made friends in 96 countries. We are honing in on 100, but we still have a ways to go to reach all 177 members of the Convention on the International Trade in Endangered Species.